Frame is a master lyricist and the inner lives of her characters are rich beyond measure. I am so excited to see this book back in print after far too long--a real classic! First published in New Zealand in 1957, Owls Do Cry, was Janet Frame's second book and the first of her thirteen novels. Now approaching its 60th anniversary, it is securely a landmark in Frame's catalog and indeed a landmark of modernist literature. The novel spans twenty years in the Withers family, tracing Daphne's coming of age into a post-war New Zealand too narrow to know what to make of her. She is deemed mad, institutionalized, and made to undergo a risky lobotomy. Margaret Drabble calls Owls Do Cry "a song of survival"--it is Daphne's song of survival but also the author's: Frame was herself misdiagnosed with schizophrenia and scheduled for brain surgery. She was famously saved only when she won New Zealand's premier fiction prize. 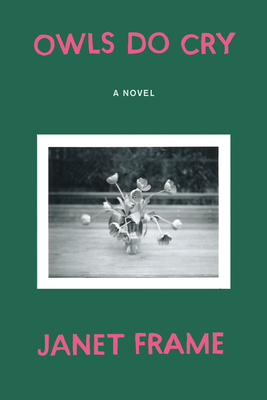 Frame was among the first major writers of the twentieth century to confront life in mental institutions and Owls Do Cry is important for this perspective. But it is equally valuable for its poetry, its incisive satire, and its acute social observations. A sensitively rendered portrait of childhood and adolescence and a testament to the power of imagination, this early novel is a first-rate example of Frame's powerful, lyric, and original prose. Janet Frame (1924-2004) was one of New Zealand's most distinguished writers. She is best known for An Angel at My Table, which the Sunday Times of London called "one of the great autobiographies written in the twentieth century," and inspired Jane Campion's internationally acclaimed film. Throughout her long career, Frame received a wide range of awards, including every literary prize for which she was eligible in New Zealand, honorary membership in the American Academy of Arts and Letters, and the Commonwealth Writers' Prize for Literature.